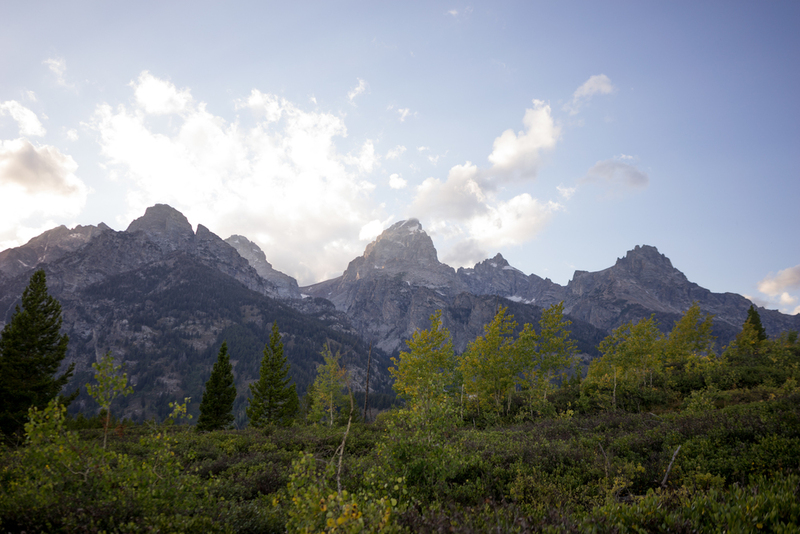 Have you heard of the Tetons in Wyoming? If you haven't, they're crazy famous and rightfully so. They are EPIC. I'll let this picture speak for itself. Tomorrow, I'll post a gallery of images from this hike. The Tetons are often photographed from the frontside (photo on right), which is magnificent and highly accessible to visitors. The photo above, however, was taken from the backside standing as close as you're going to get of the Tetons. Let's just say, we were right up in their business. 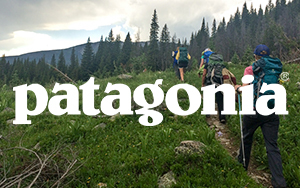 All that to say, the Teton Crest Trail should not be missed. It's one of my favs! Here's everything you need to know to get yourself on that trail. The day before we started the trek, we picked up our first-come, first serve permit at the ranger station and stayed at a hostel in Teton Village. The following morning, we started our trek straight from the hostel. The route we took was one-way, point A to B. We cut out the first few miles of climbing by taking a tram to the top of Rendezvous Mountain. (Side note: I had heard that first climb wasn't entirely worth it, so we happily skipped it based on that recommendation. Plus, the tram was super fun!) We started from the south end of the trail and ended north at Jenny Lake, five days later. We then took a bus from Jenny Lake into the town of Jackson Hole to eat celebratory pizza and chicken wings. From there, we took another city bus back to Teton Village where our car was parked. There are variations to everything we did, but this was my approach to an affordable and challenging but not crazy backpacking trip. Day 1: Rendezvous Mountain (End of tram ride) to Marion Lake (~6 miles) - When you get off the tram, first stop and use the bathroom at the little cafe up there. Then head left to the ridge line toward the service road. Follow the trail makers toward Marion Lake. You might get a little confused because it's not marked "Teton Crest Trail." Walk away from the tram. Day 2: Marion Lake to Hurricane Pass (~10 miles) - Strenuous day of climbing two passes. People typically stay at Sunset Lake to make this an eight mile day, but I wanted to see sunset and sunrise at the pass (see pic above), so we took on two passes that day. Day 3: Hurricane Pass to Holly Lake (~10 miles) - You'll hike down down down down and then up up up up. Solitude Lake is gorgeous and worth stopping at before your uphill trek up to Paintbrush Divide. Day 4: Holly Lake to Leigh Lake Site #13 (~6.5 miles) - Mostly all downhill. You'll see many day-hikers going in the opposite direction. When you get to the bridge, don't cross. Keep going north to Leigh Lake. The trail isn't super duper clearly marked, but clear enough. Trust it because campsite #13 is EPIC. It's a white sand beach, completely private with two established tent sites and a fire pit. I would highly recommend it. Day 5: Leigh Lake Site #13 to Jenny Lake Visitor Center (~5 miles) - Wake up early and watch the sunrise. If you're there in the fall, the elk's prehistoric bugling is a sound like no other. You will feel transported into another world. The hike to Jenny Lake Visitor Center is beautiful with not a lot of elevation gain or loss. You'll see more day-hikers and cars along this hike because there's such great access to see the Tetons from the front. You will definitely appreciate that just two days ago, you were standing behind them. It's a tremendous feeling of accomplishment and gratitude. *Note: There are other options for how to hike this trail. I personally loved this approach because I felt like we saved the "best" for last. July could be buggy and still be pretty snowy. Check with the rangers for trail conditions. August could be pretty buggy, but bursting with wildflowers (recommended). September has little to no mosquitos, but most of the wildflowers are gone; weather can be fickle (recommended). October has high risk of very unpredictable weather. It was a fairly challenging hike. Climbing up the passes were somewhat lengthy and difficult, however there were also portions that felt easy. If you're prepared mentally to do a fair amount of uphill hiking, you'll be fine. The endless amazing views will energize you to keep going. It's impossible to predict weather, but when I went in mid-September it was supposed to be 50s-60s during the day and drop down to the 10s-20s in the evenings. It actually turned out to be 32 degrees when we got off the tram, with some snowfall. It snowed lightly all day and stayed in the low 30s. That night, it dipped down into the single digits. We were VERY COLD. Each subsequent day was warmer, but that unexpected cold snap was pretty harsh. Definitely call the ranger station to get the most up-to-date info to plan your clothing appropriately. Be prepared for anything to happen in the backcountry! Weather is always unpredictable. Use your favorite maps app to get to Teton Village. Make sure to find a parking spot that's okay to be parked at for a few days. (In the fall (low-season), we parked near The Hostel, since we were paying customers.) From there, we walked to the Jackson Hole Mountain Resort tram ticket window to pick up our prepaid tickets, and hopped on one at 9am. It will take you straight up to Rendezvous Mountain where you'll begin. Book online or buy tickets at the window. Tip: It's $5 cheaper to buy your ticket online and pick it up at the window. 15 minute ride up to the top of Rendezvous Mountain with awesome views of the valley. *Tip: Since there were three of us, we got a private bunk so we could sprawl all our gear and food and distribute accordingly. We ended up paying $38/person for one night for the private bunk room. Catch the red or green bus at Pearl and Glenwood. The bus stop has old school auditorium seating. We had a delicious pizza, chicken wings, salad, soda and beer to celebrate when we got into Jackson. It was reasonably priced, delicious, and very filling! Do you have any questions? I'd be happy to share what I learned. Older PostLighten Your Load / Have you considered a kid's toothbrush?